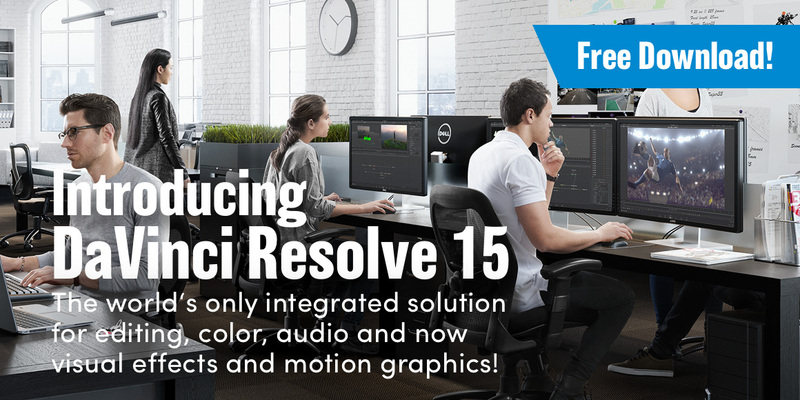 DaVinci Resolve 15 is a massive upgrade that fully integrates Fusion visual effects and motion graphics, adds even more audio tools plus hundreds of new features and improvements that editors and colorists have asked for! This is easily the biggest update ever! DaVinci Resolve 15 features an entirely new Fusion page for creating feature film quality visual effects and motion graphics animation. The new Fusion page is a true 3D workspace with over 250 tools for compositing, vector paint, particles, keying, rotoscoping, 2D and 3D text animation, tracking, stabilization and more. Fairlight audio has also been upgraded in DaVinci Resolve 15. There are extensive ADR tools, retiming with pitch correction, normalization, audio and video scrollers, a fixed playhead with scrolling timeline, sound libraries, and over a dozen built in cross platform FairlightFX plugins such as reverb, hum removal, vocal channel and de‑esser. Editors and colorists get new stacked and tabbed timelines for quickly copying and pasting shots between sequences, dramatically faster project loading, on-screen annotations, subtitle and closed captioning tools, 2D and 3D Fusion title templates, a floating timecode window, a new LUT browser, shared grades, multiple playheads and improved HDR support. In addition, new ResolveFX let customers quickly patch blemishes or add/remove unwanted elements in a shot using smart fill technology. There are also new ResolveFX for dust and scratch removal, lens and aperture diffraction effects, and more. Customers love the original Blackmagic Pocket Cinema Camera and have been asking us for a 4K version. We’ve listened and built a camera that combines all of our newest technology with customer feedback from the previous model! The new Blackmagic Pocket Cinema Camera 4K has a full 4/3 HDR sensor, dual native ISO up to 25,600 with incredible low light performance and 13 stops of dynamic range. 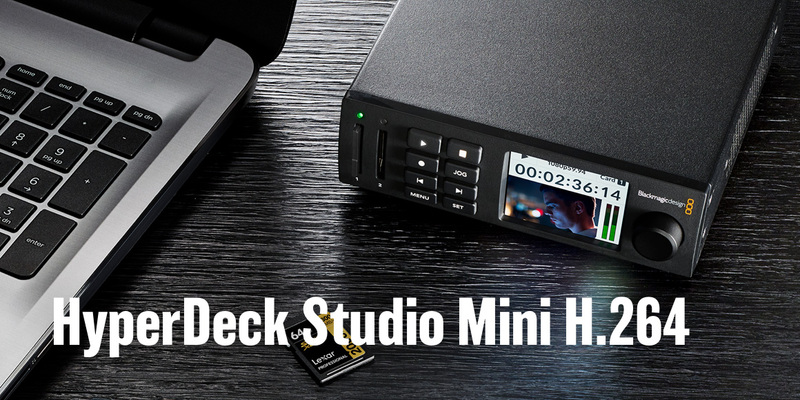 It features a unique USB-C Expansion Port, which allows customers to record using the internal SD/UHS-II and CFast recorders or directly to the same external disks you can use for editing and color correction! The design features a new lightweight carbon fiber polycarbonate composite material so the camera body has incredible strength and rigidity to protect it from accidental knocks and drops. The handheld design features a multi function grip which has logically placed buttons and dials that allow super fast access to essential shooting functions such as recording start/stop, still photos, ISO, shutter, aperture, white balance, power and more. The Blackmagic Pocket Cinema Camera 4K has an MFT lens mount, large 5 inch touchscreen monitor, 10-bit ProRes and 12-bit RAW recording, 3D LUTs, 4 built in microphones, mini XLR audio input with phantom power, Bluetooth wireless camera control, HDMI on set monitoring output and more. 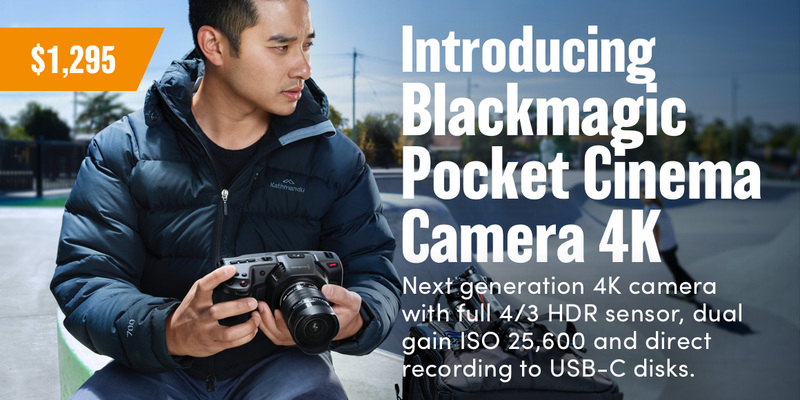 The Blackmagic Pocket Cinema Camera 4K lets customers shoot images that are far better than DSLR cameras and even better than professional digital film cameras costing tens of thousands more. It will be available from Blackmagic Design resellers worldwide later this year for only $1,295. The new ATEM Television Studio Pro 4K is a professional all in one Ultra HD live production switcher with integrated hardware control panel. This new model, while not the biggest switcher we have, is now easily the most powerful switcher we build. It features 8 standards converted 12G-SDI inputs and this means you can plug in any HD or Ultra HD source and it will convert it to the switcher standard. With 12G-SDI you can work in 720pHD, 1080iHD, 1080pHD and Ultra HD up to 2160p59.94. Each input also has a 12G-SDI program output to send to cameras and for use with the built in talkback. What’s really exciting is we have taken the Fairlight audio mixer and built it into this switcher. This means each SDI input now features powerful audio processing including 6 Band parametric EQ, compressor, limiter, expander/noise gate, proper pan, audio channel split to dual mono, stereo simulator on analog and mic inputs and an audio delay on the analog inputs. There is also 90 frames of Ultra HD motion clip storage, or 360 frames in 1080 HD and 800 frames in 720p HD and the multiview can be selected between HD and Ultra HD so you get twice the sharpness. 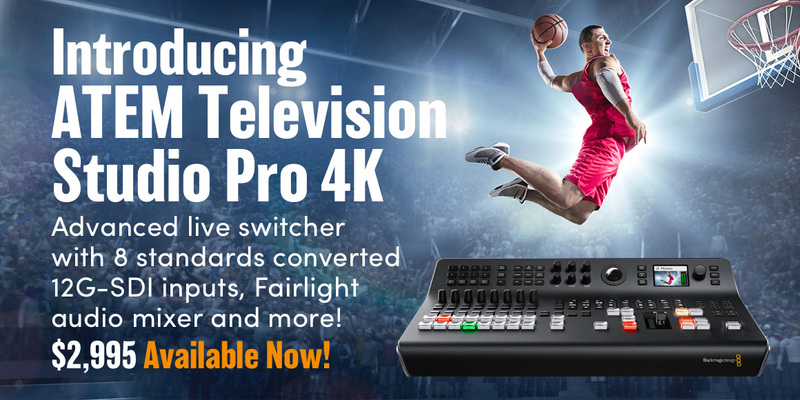 The new ATEM Television Studio Pro 4K also features the new ATEM Advanced Chroma Keyer. We think this is a very powerful switcher and we think it can help move live production into high end Ultra HD, while being an all in one design with switcher and control panel combined, which means it retains its portability! We also announced our new second generation Cintel film scanner. The new Cintel Scanner 2 adds incredibly fast 40Gb/s Thunderbolt 3 and PCIe connections, support for HDR, timecode out for syncing to external equipment, and more. Cintel Scanners have become the most popular film scanners in the world and give you a way to scan your existing libraries of 35mm and 16mm film all the way up to 4K for UltraHD broadcast. The combination of the Cintel Scanner 2 with the new HDR tools in DaVinci Resolve 15, make it the fastest way to prepare your library to meet the growing demand for 4K HDR from services such as Netflix and Apple iTunes! We will be demonstrating the new generation Cintel Scanner 2 at NAB and showing how the HDR scanning will work. This update will be available for both the original Cintel Scanner as well as the new model and both will be available from mid year. 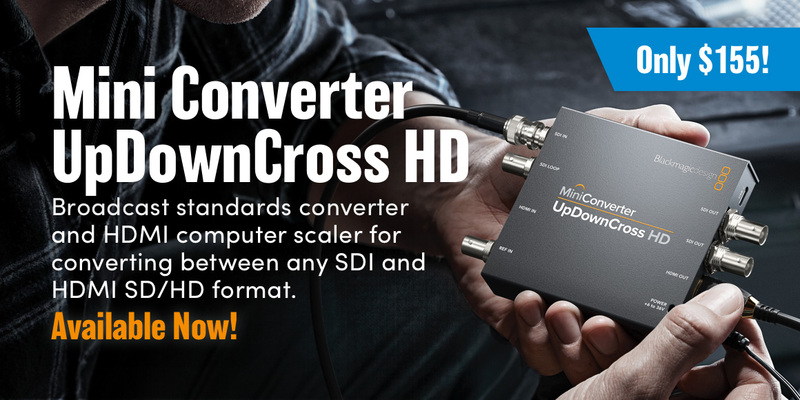 Blackmagic Mini Converter UpDownCross HD is a new broadcast quality standards converter that lets you convert any SD or HD video format to any other SD or HD video format via SDI and HDMI input and output connections. You get full 10-bit broadcast quality video processing with over 140 different standards and format conversions in a durable and affordable all metal design. Plus, it automatically scales computer resolutions to standard broadcast formats, making it easier than ever to plug laptops into professional broadcast equipment such as digital projectors! The new Blackmagic Mini Converter UpDownCross HD is great for protecting equipment from the wrong video signal, plus it’s also great for converting computer HDMI outputs to SDI because you don't have to care about the computer settings, as the converter will take care of any format! The new Blackmagic Mini Converter UpDownCross HD is available now from Blackmagic Design resellers worldwide for $155. 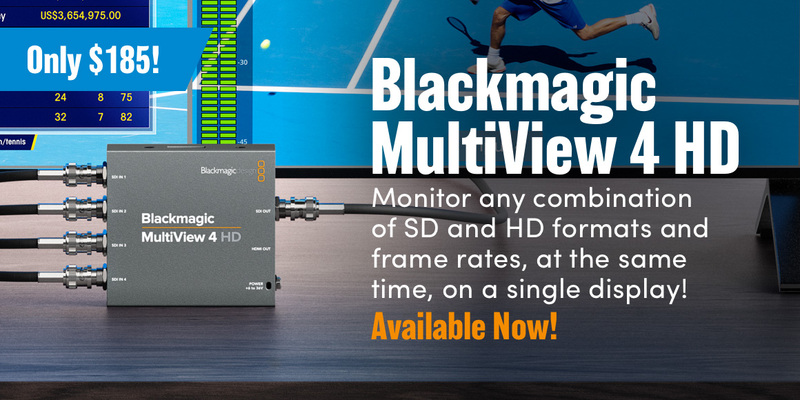 The new Blackmagic MultiView 4 HD is a new multi view processor that lets you monitor 4 completely independent SDI video sources on a single display. You can monitor any combination of SD and HD formats and frame rates in each view all at the same time. Blackmagic MultiView 4 HD has both SDI and HDMI outputs so it can be used with both professional SDI broadcast displays or big screen consumer HD televisions. There has never been a more professional multiview solution, with features such as on screen labels and audio meters, at this affordable price. It’s like having 4 completely independent broadcast monitors on a single display. It’s so flexible, you can use it to view mixed video formats with different frame rates at the same time on a single screen. 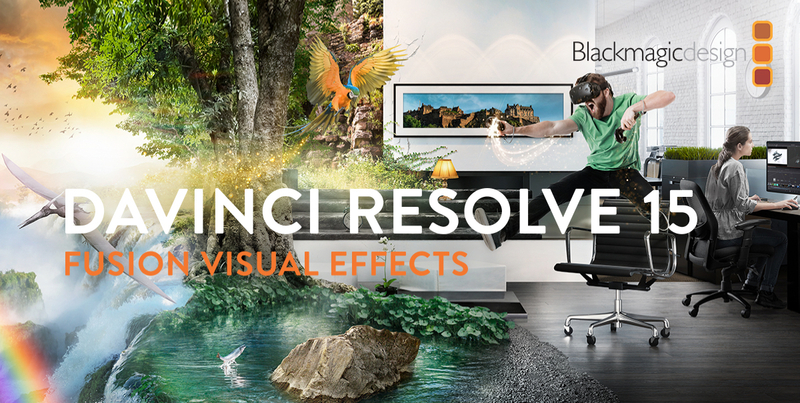 Blackmagic MultiView 4 HD is available immediately from Blackmagic Design resellers worldwide for only $185. at the same time. 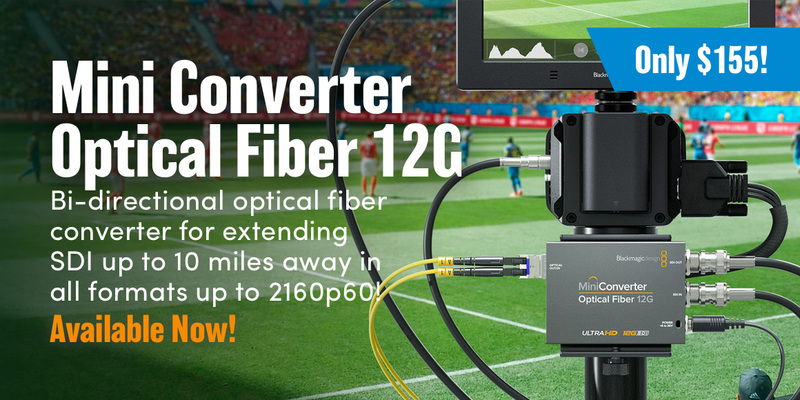 Using the new Blackmagic Mini Converter Optical Fiber 12G is an affordable way to increase camera coverage at live events. It’s perfect for placing cameras around the studio, for use at outdoor sporting events, or even concerts and theatrical performances in large venues. The Blackmagic Mini Converter Optical Fiber 12G features multi rate 12G-SDI connections that automatically detect the video signal and switch speeds. That means it’s compatible with all SD, HD and Ultra HD formats and equipment up to 2160p60, including Level A and B devices. The converter accepts any SMPTE standard SFP optical fiber module and you can install the module for the SDI rate you need, or use modules you already own! Blackmagic Mini Converter Optical Fiber 12G is available now from Blackmagic Design resellers worldwide for $155. The new Blackmagic Micro Converter BiDirectional SDI/HDMI is an incredibly small pocket size, broadcast quality video converter that simultaneously converts SDI to HDMI and HDMI to SDI. It works in all SD and HD formats up to 1080p60. The new Blackmagic Micro Converter BiDirectional SDI/HDMI gives you full 10-bit broadcast quality video processing in an incredibly small design that fits in your pocket. Plus, it works in both directions with different video formats at the same time, so it’s like getting two converters in one! 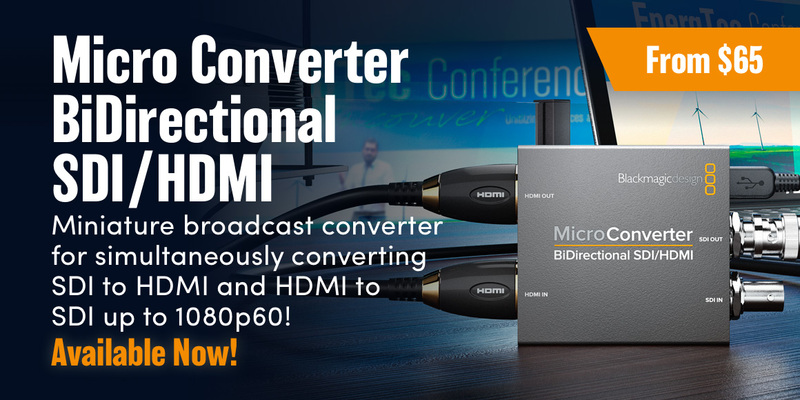 Blackmagic Micro Converter BiDirectional SDI/HDMI is available now from Blackmagic Design resellers worldwide from only $65. As you can see, we’ve been very busy working hard to build the products you need and it’s a privilege to be able to do this for you. It's also exciting! Our new DaVinci Resolve 15 software is a game changer and the new hardware tools help ensure that you have everything you need to make incredible looking television programs and films. We can’t wait to see what you create this year!